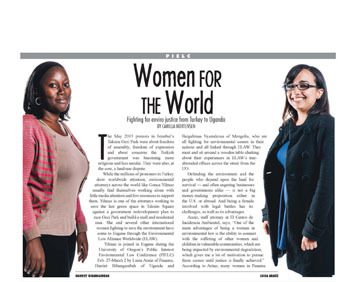 Best regards, read about Baigalimaa, Harriet, Luisa, and Gonca in today's Eugene Weekly. ELAW Fellows and visitors from five continents have come together in Eugene to work with the ELAW team! Baigalimaa (Mongolia), Harriet (Uganda), Luisa (Panama), Marco (Mexico), Gonca (Turkey), and Oksana and Liubov (Russia) are here to collaborate on efforts back home to protect communities and the environment. Find their profiles here. We also have Calvin, Andrew, Anna, and Gavin visiting from Canada. They will join our Fellows at today's opening session at the 2014 Public Interest Environmental Law Conference. We are inspired by these courageous grassroots advocates and working face-to-face we build the bonds that make the ELAW network strong. If you are in the area, we look forward to seeing you tonight at our reception -- 7:30 pm at the Maude Kerns Art Center.